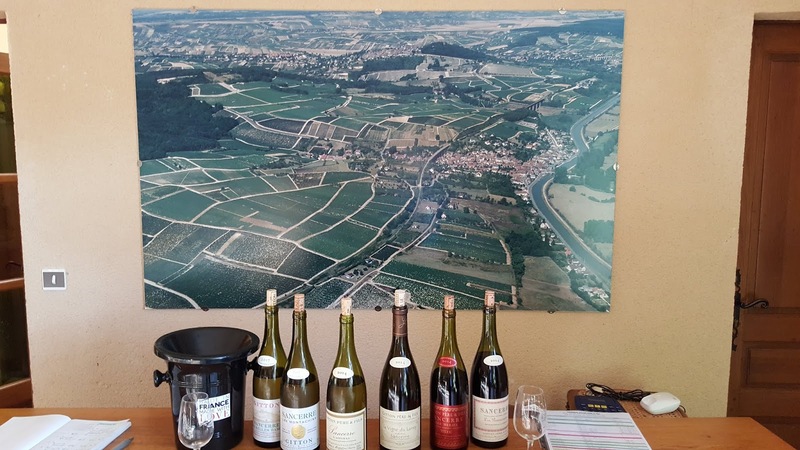 "Elle" - Exploring the European Inland Waterways: Canal Lateral a la Loire: Sancerre and surrounds - a wine tourist’s delight. Canal Lateral a la Loire: Sancerre and surrounds - a wine tourist’s delight. 18 and 19 October 2018. No cruising, only battery driven cycling. With the topsides drenched in dew and mist we unloaded the bikes, making sure the batteries were topped up to the utmost, and set off among the pale-ing vineyards which have lost their summer lushness but have not yet reached into autumn hues, up the almost two hundred and fifty meter rise to the hilltop town of Sancerre. Eventually finding the tourist office (not open in the mornings but with town maps thoughtfully provided in a Perspex box affixed to the gatepost) we then found our bearings and the Le Poste where we thankfully retrieved our precious parcel of paint and filler, sent from Chitry-les-Mines. Perched on its rock 312 meters high, it dominates the splendid panorama of the Loire Valley. From the Esplanade of Porte César, you can see a wonderful landscape painting of the faraway mountains of the Morvan presented in delicate pastel tones. Surrounding Sancerre and lovingly maintained by winemakers proud of their ancestral traditions, the vineyards producing Sancerre wines seem ready to lay siege to the town! 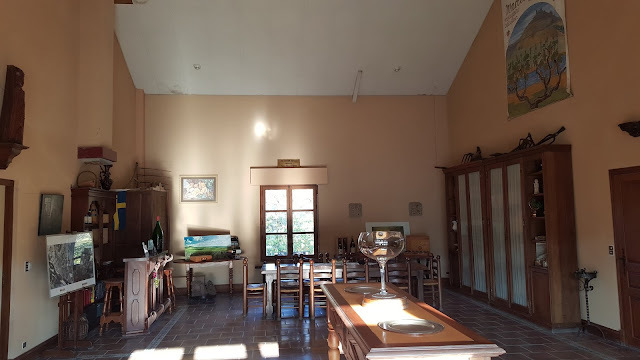 "Le Fil d'Ariane" (self guided walking tour) leads you through the old winemaking and bread making quarters of town as well as by XVth century buildings and numerous art galleries. A "must see" when evening comes and the town's beautiful monuments are illuminated ! The Fief's Tower, a remnant of the feudal castle built by the earls of Sancerre, offers a magnificient 360 degrees bird's-eye view of the city and surrounding countryside. Sancerre's wines and the Crottin de Chavignol - goat cheese of the village of the same name - belong to the French family of local products and carry the AOP ("Appellation d'Origine Protégée"). And there is much more of interest than the town boasts about! Fabulous place for a visit even if it is a tad touristy but these places have to be to attract the tourist spend. A bad picture of a lovely square. A medieval tower restored by the sancerre winemakers. The Chateau of the Dukes. The Church and adjacent (rare) belfry. Coeur de France - once a mansion and now the art school. named, for their shape, after the descriptive French word crotte (dung). The winemaker's name we most associate with Sancerre. Misty view to St Satur. The Dukes palace from half-way down. The next day started with a walk around ‘our’ village of Ménétréol-sous-Sancerre; if you are looking for markets, shopping arcades and all the accouterments of bigger places then give this place a miss. Ancient stonework of limestone, flint, marlstone and reject clay tile, contrasting aspherical roof angles and ancient timber beams backstopped by the enormous viaduct beyond which lie gentle slopes of neat vine-rows. Absolutely fascinating if one just wanders and lets the eyes do the processing. Marquesse Polo - the explorer. head spout, was designed to hold the handle of a bucket over the outlet. A different pump manufacturer but note the small bucket handle lip on the spout. a goat cheese farm and two wine growers’ retail outlets. Then it was off to St Satur to see what the main Sancerre port looked like – thank goodness we were advised by Gary and Tosca to avoid the dump! The village itself was bustling and had a fascinating church – believe it or not, a 15th Century uncompleted half-a-cathedral having basically an apse and a choir but no transepts nor nave (I hope I have that correct). The townsfolk ran out of money to support such a huge project (tax revolt?). A copy Reubens flanked by restored Stations of the Cross. To end our day and stay we biked up Ménétréol-sous-Sancerre’s small incline to the tasting room of the estate Gitton Père & Fils where we tasted a range of their not inexpensive offering and toddled back to Elle much the poorer but with an assortment of some lovely Sancerre whites (and one untasted Sancerre rosé). Tomorrow, at crackers in order to make the last of the three locks before midday, we will set off for an overnight stay at Léré.